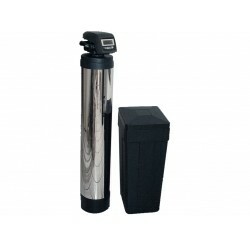 Here at Tru Water Filters we stock a premium range of water softeners to treat any hard water issues. Ultramax Water Softener & Conditioner UM-8100 Ultramax™ Standard Features: - 1" true high flow throughout system - Flow Rates up to 25 gpm - Only two moving parts in the water stream. - 28 Day Self-Adjusting Variable Reserve (learns water usage) - Fully Programmable Control - Att..
Ultramax Water Softener & Conditioner UM-8150 Ultramax Standard Features: - 1" true high flow throughout system - Flow Rates up to 25 gpm - Only two moving parts in the water stream. - 28 Day Self-Adjusting Variable Reserve (learns water usage) - Fully Programmable Control - Attr..